On reading a new paper by Stephen Hawking that appeared online this week, you would have been forgiven in thinking the world-renowned British physicist was spoofing us. Hawking's unpublished work — titled "Information Preservation and Weather Forecasting for Black Holes" and uploaded to the arXiv preprint service — declares that "there are no black holes." Keep in mind that Hawking's bedrock theory of evaporating black holes revolutionized our understanding that the gravitational behemoths are not immortal; through a quantum quirk they leak particles (and therefore mass) via "Hawking radiation" over time. What's more, astronomers are finding new and exciting ways to detect black holes — they are even working on an interferometer network that may, soon, be able to directly image a black hole's event horizon! Has Hawking changed his mind? Are black holes merely a figment of our collective imaginations? Are all those crank theories about "alternative" theories of the Cosmos true?! Stephen Hawking hasn't changed his mind about the whole black hole thing, but he has thrown a complex physics paradox into the limelight, one that has been gnawing at the heart of theoretical physics for the last 18 months. It all boils down to a conflict between two fundamental ideas in physics that control the very fabric of our Universe; the clash of Einstein's general relativity and quantum dynamics. And it just so happens that the extreme environment in and around a black hole makes for the perfect "fight club" for the two theories to duke it out. But what's the first rule of the black hole fight club? Don't talk about the firewall, lest you get sucked into an argument with a theoretical physicist. At a California Institute of Technology (Caltech) lecture in April 2013, Hawking and other prominent theoretical physicists had an opportunity to describe the problem at hand. Caltech's Kip Thorne, for example, described the firewall paradox as "a burning issue in theoretical physics." However, the quantum universe contradicts this "no drama" event horizon idea as predicted by general relativity. 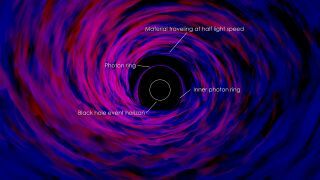 In 2012, a group of physicists headed by Joseph Polchinski of the University of California in Santa Barbara revealed their finding that if black holes truly do not destroy information — a standpoint that Hawking himself reluctantly advocates — and that information can escape from the black hole through Hawking radiation, there must be a raging inferno just inside the event horizon they dub the "firewall." In this case, rather than falling into a "no drama" event horizon, our unlucky astronaut gets burnt to a crisp before getting ripped apart by tidal shear. This is the very antithesis of "no drama" and, therefore, a paradox. Hawking thinks that the idea behind the event horizon needs to be reworked. Rather than the event horizon being a definite line beyond which even light cannot escape, Hawking invokes an "apparent horizon" that changes shape according to quantum fluctuations inside the black hole — it's almost like a "grey area" for extreme physics. An apparent horizon wouldn't violate either general relativity or quantum dynamics if the region just beyond the apparent horizon is a tangled, chaotic mess of information. "Thus, like weather forecasting on Earth, information will effectively be lost, although there would be no loss of unitarity," writes Hawking. This basically means that although the information can escape from the black hole, its chaotic nature ensures it cannot be interpreted, sidestepping the firewall paradox all together. Needless to say, this paper has done little to convince Polchinski. "It almost sounds like (Hawking) is replacing the firewall with a chaos-wall, which could be the same thing," he told New Scientist. Much of the theoretical debate is hard to fathom and the result of calculations of physical events that we cannot possibly experience in our day to day lives. But don't mistake this particular debate as solely a high-brow argument in the theoretical physics community. Its foundations are rooted in the growing discomfort we are feeling with the mismatch of general relativity and quantum dynamics (particularly what role gravity plays in the quantum world), a problem that cannot be solved with our current understanding of the universe.